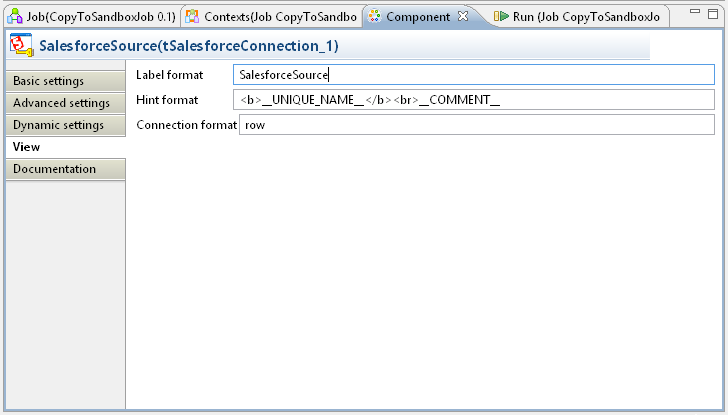 A common problem with Salesforce Developer Sandboxes is that they are blank. Really you're going to want some data in there, so there are various strategies for copying data from your live instance to the Sandbox. There are some paid-for solutions - SFXOrgData, Salesforce Partial Data Sandboxes - but if you've got a decent ETL tool you can build your own. 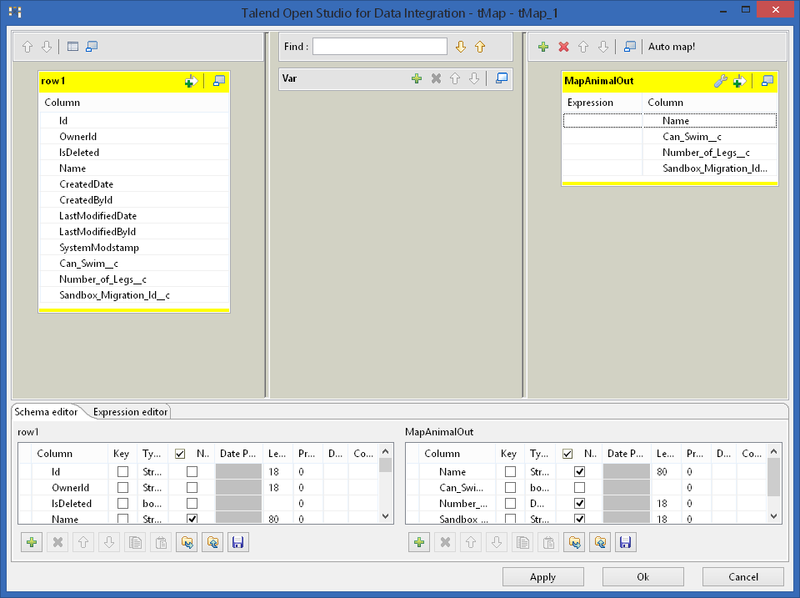 For the task of copying data from live to a Sandbox, either Pentaho or TalenD Open Studio could be used, depending on preference. Here's a good comparison of the differences between them. For the purposes of this blog post, I'm going to concentrate on TalenD. 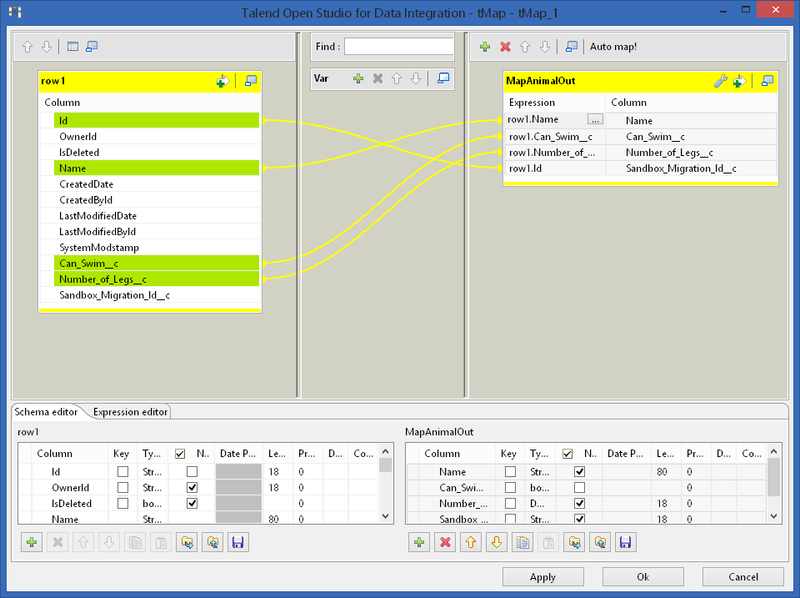 TalenD is an open source ETL tool based on the Eclipse IDE. It has a multitude of features and connectors, which makes it very useful. And, not to beat about the bush, it also makes it very big and potentially confusing. Its one of those really really big Java programs that has that ... well, "Java" sort of look to them. It has good Salesforce support but its not built for Salesforce specifically which means that there are some idiosyncracies in the way it handles custom objects for example. But, on the plus side, it works, its pretty fast with data, its properly open-source and it has a fairly big community of users. 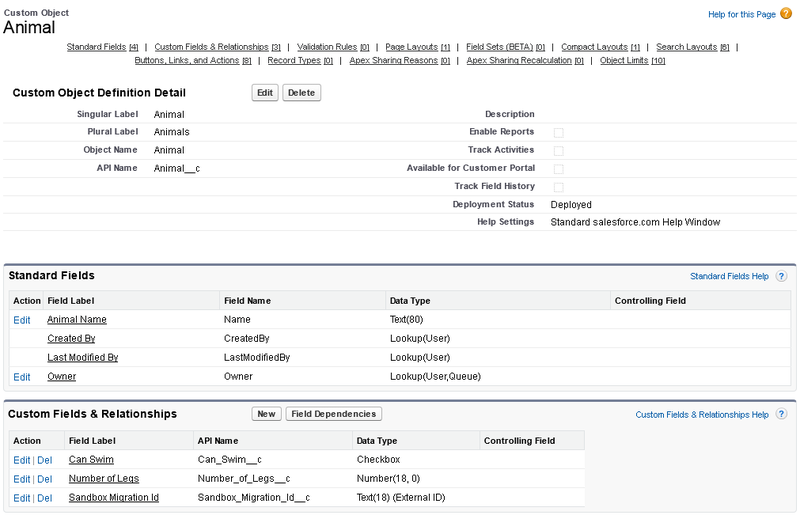 In this example we want to transfer a subset of the Contacts from our Live site to our Sandbox. Its a subset because the Developer sandboxes have a limited amount of space. We also have a picklist/lookup table called 'Animal' (thats a custom object, obviously) - we want to transfer all of those Animal records. In our example, each Contact can have one or many 'Pet' records. 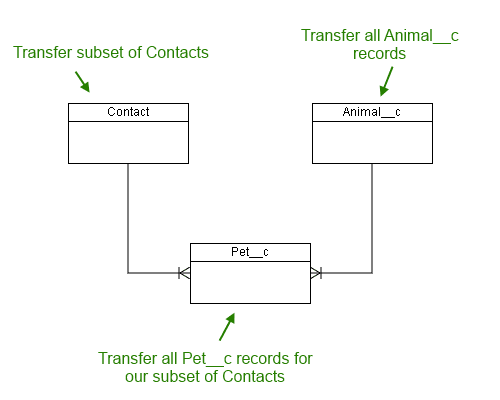 We want to transfer all of the Pet records that belong to our subset of Contacts. 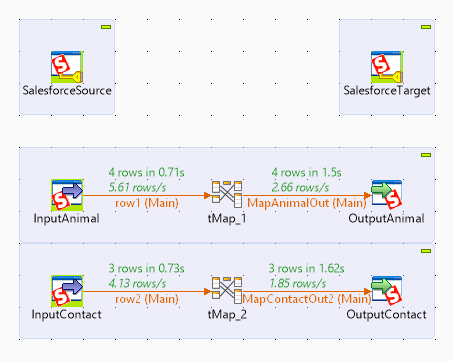 Note that Pet has a foreign key to both Contact and Animal - handling foreign keys when moving data to Salesforce Sandboxes is a bit of a challenge so thats why our example has two of them. Note that we are not transferring Accounts, just Contacts, to make this example easier. In my particular case, the underlying Salesforce Instance has the Salesforce Non-Profit Starter Pack (SPSP) which uses some tricks to make the Contact -> Account relationship less important (it automatically generates an Account for each Contact for you). In a regular Salesforce inastance, not setting the Account for a Contact is allowed but will lead to it being a 'Private Contact' only visible to its owner. For this example, that'll have to do. If you need to transfer Accounts as well in your scenario, it should be fairly clear how to extend this example to allow that. The Contact object in this example is the usual Contact object. One custom field has been added - Sandbox_Migration_Id__c, the significance of which will be explained below. For this example we will only be transferring contacts with a LastName matching 'Testperson' (as show in Pet list above). You then get a TalenD welcome screen which gives you the chance to catch up on the latest ... er ... TalenD news. Select the "Create a new Job ..." option, or just press "Start Now" and right click on 'job designs' to create a new Job. On the left you have a Job called "CopyToSandboxJob 0.1" under "Job Designs". On the right you have a bazzillion different components to use (we're going to use exactly 4 of them). In the middle is the blank slate where we're going to wire-up our job. At the bottom is a mutli-tab Properties box type area where most of the fiddling around will happen. Salesforcce WebService URL: for live instances the default value will be correct. For sandboxes rename the first 'login.' part of the URL to be 'test.' as above. 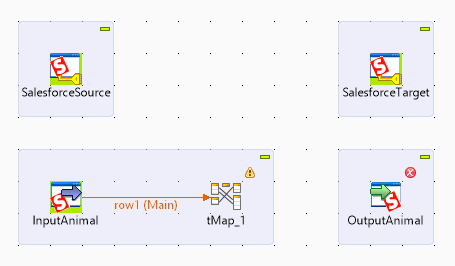 Label format will default to __UNIQUE_NAME__ which tells TalenD to generate a name. But you can replace Label format with your own text and the component will then be given that name on the canvas. In the screenshot above we've called it 'SalesforceSource'. Next we need to set up a Repository of Meta-data - a description of the Salesforce objects that we are going to be dealing with. 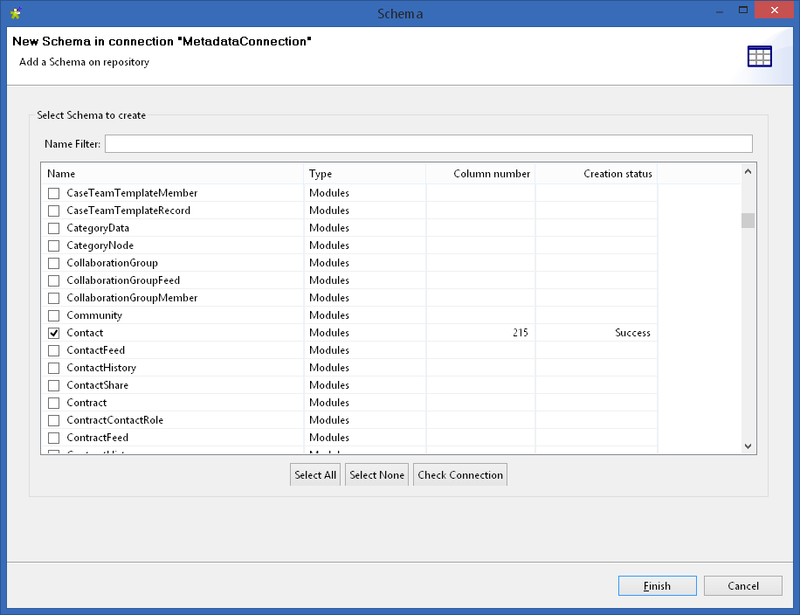 TalenD is keen on meta-data, and likes to have schemas centrally defined rather than each component creating it own - although it can do that as well. 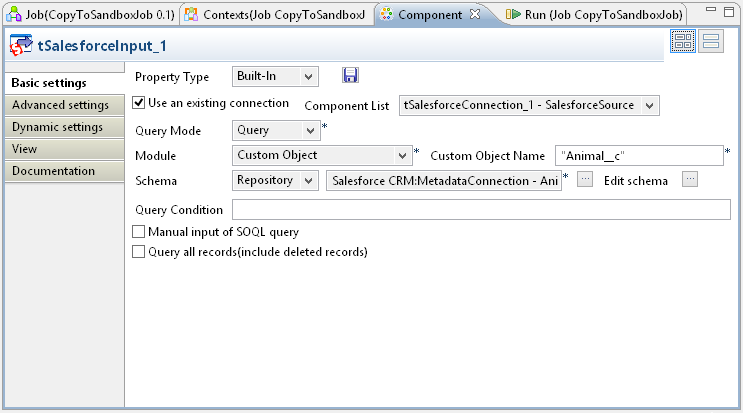 Getting the meta-data right is especially important with Salesforce Custom Objects. You can then press the 'Check Login' button to test the connection. If its ok press Finish. You are then presented with a big list of the objects in the Salesforce Instance that you connected to. You need to tick the box for the objects you want to work with (in this case, Contact, Animal__c and Pet__c). As you tick each box, the Creation Status column will say 'Pending' and then 'Success' as it downloads the metadata for each table. Some hints: Custom Objects will be at the bottom of the list. You can use the Name filter box to filter the list, however sometimes this seems to cause the 'Finish' button to disable itself, meaning you cannot complete the dialog. So you're probably better off just scrolling through the list, ticking the objects you need. 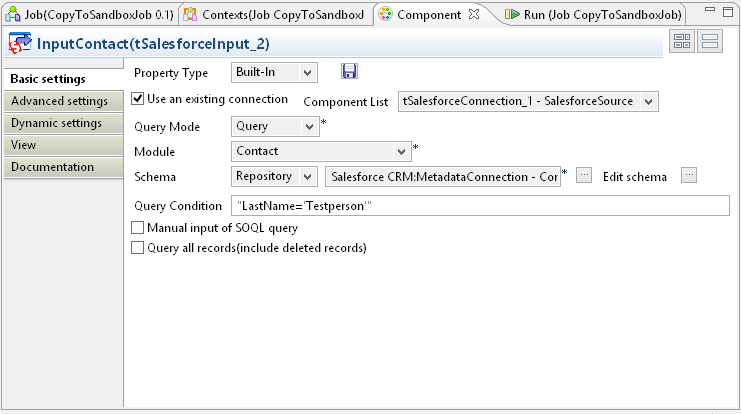 Salesforce will generate new 'Id' values in the Target instance. Source Ids will not match Target Ids. Other system fields such as Created By/Last Modified By will be generated at the Target. The Id change is the most serious issue. Remember that we are copying Contact, Animal__c and Pet__c, and that Pet__c has foreign keys to both Contact and Animal__c. In the Source database, those relationships are represented by Id values, but in the Target database all the Id values are going to be different. Relate the lookup values in Pet__c to Contact and Animal__c, by using the External IDs on Contact and Animal__c. Note that strictly speaking you only need the'Sandbox Migration Id' fields in the target instance. But it would be a pain to manually add them to a sandbox every time you create a new one. For that reason I'd recommend adding these fields to the live instance. You wont actually use them in the live instance, but every time you generate a Sandbox the fields will be there ready to be used. Drag a tSalesforceInput component from the Palette on the right over to the canvas. 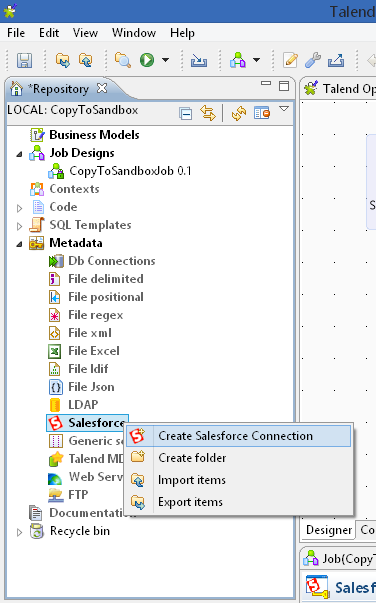 "tSalesforceInput" here means 'input data into the Talend job from Salesforce'. Check the "Use an existing connection" checkbox. The login fields will disappear and be replaced by a picklist that lets you choose from the tSalesforceConnection objects already on the canvas. We want to choose the 'SalesforceSource' one. 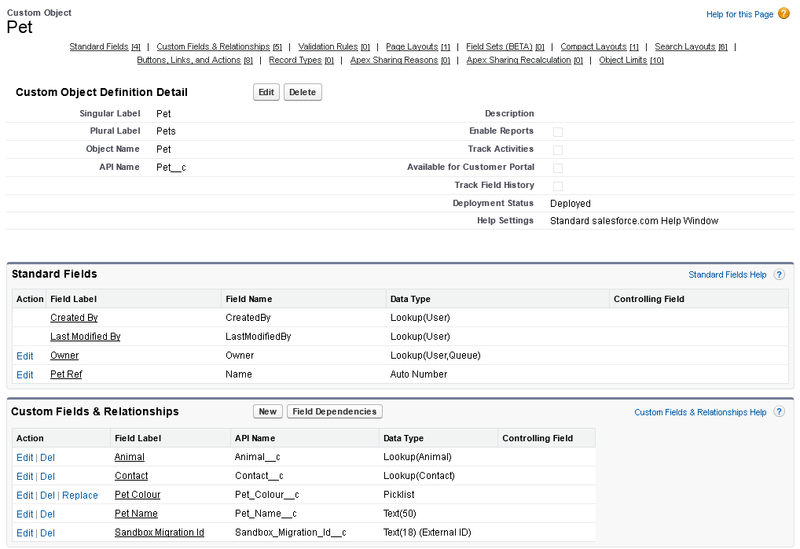 The 'Module' field lists the standard Salesforce objects. Scroll right to the bottom of the list and choose 'Custom Object'. A new textbox 'Custom Object Name' will appear, in which we want to type "Animal__c" (with speechmarks). 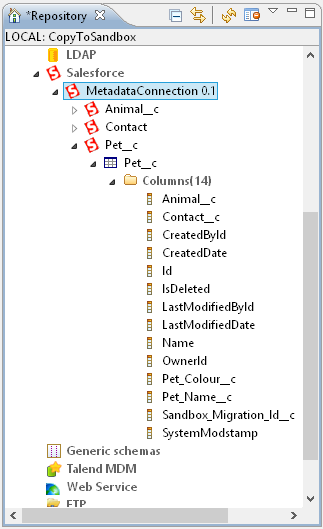 Next we want to clear the Query Condition (we want to transfer all the Animal__c rows). So set Query Condition to blank. Finally we'd better give this component a different name. Switch to the view tab of the settings and replace Label format "__UNIQUE__NAME__" with something like "InputAnimal"
Change 'Action' to 'Upsert'. We're going to use Upserts everywhere, so that the job can be re-run as much as we want during testing. An 'Upsert Key Column' picklist will appear, but it will be empty - we'll come back to that. In the Module picklist, as with the Input component, scroll to the bottom and select 'Custom object'. Then type "Animal__c" (with speechmarks) in the box that appears. 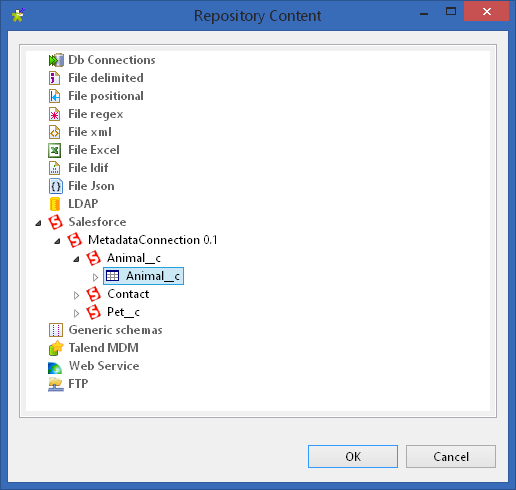 For Schema choose "Repository" and then (as with the Input component) press the ellipsis button and choose the Animal__c table from the Repository Contect dialog (see screenshot above). Switch to the View tab and set Label format to something like "OutputAnimal"
If you can't get the right-click-and-drag to work, the other option is to right click on InputAnimal and select "Row -> Main" from the top of the right-click menu. You will then be in 'drag a line' mode and can go and click on tMap_1 to join the two components together. 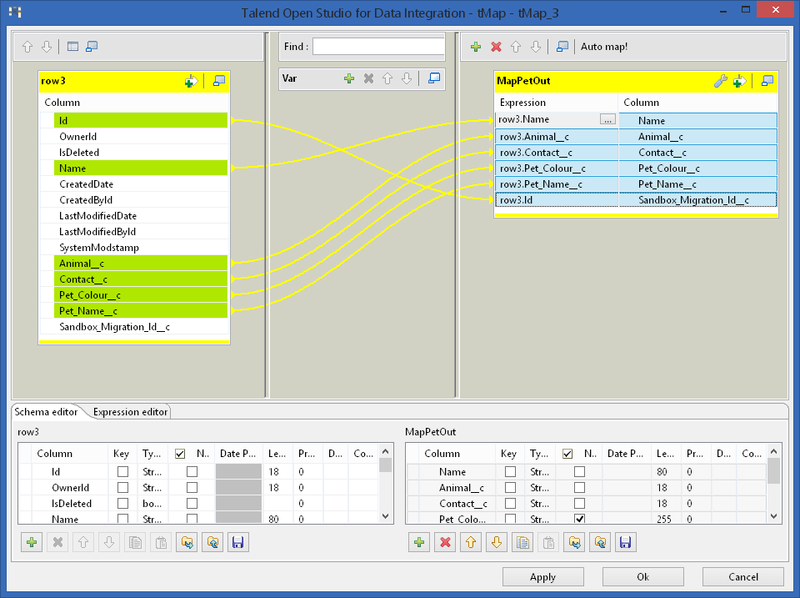 Now we right click on tMap_1 and drag the connecting line to the 'OutputAnimal' component. 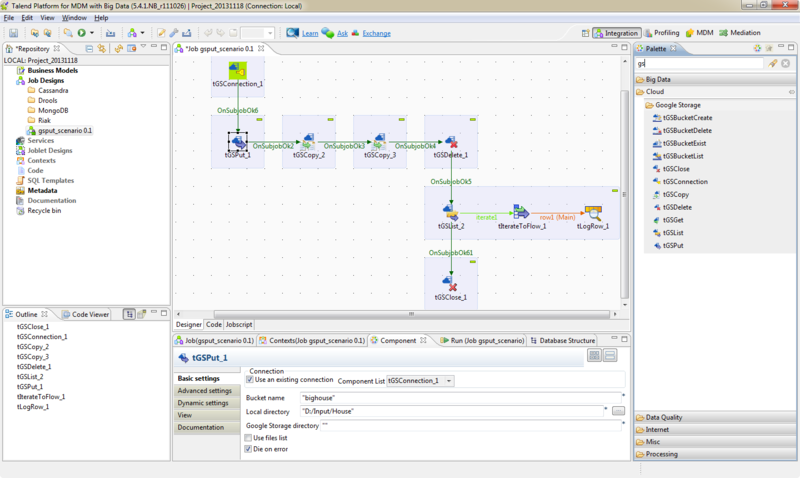 This time a dialog will appear; TalenD wants us to name this new connection. Type something like 'MapAnimalOut' (you will notice the unhelpful 'input is invalid' warning will disappear once you type something) and press OK.
You will now get another dialog - "Do you want to get the schema of the target component?". Press Yes. 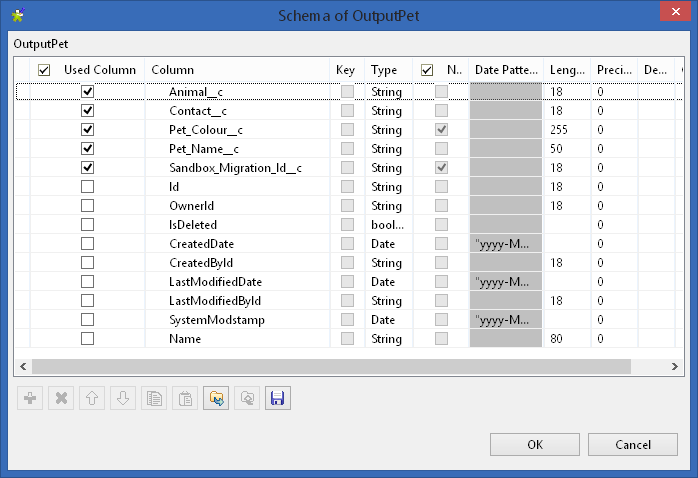 What this means is, the tMap output will use the schema of the OutputAnimal component that you connected it to. The light blue box that has appeared around the connected components is called a Subjob. You can have many Subjobs within a Job. The little red X above the OutputAnimal component is there because we still havent filled in the 'Upsert Key Column'. We will get round to it. You can do a lot with this tMap component. 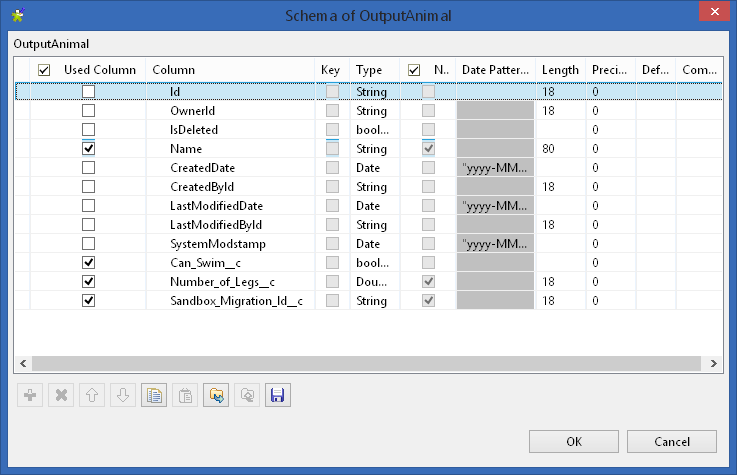 The input is on the left - it will have picked up the schema from the 'InputAnimal' component. The output on the right has fewer fields because we adjusted the 'OutputAnimal' schema to remove the read-only/system fields. More details of the schemas are shown at the bottom. This dialog will let us map input fields to output fields, but it can also do lots of other things, like formulas, multiple outputs and so on. Press the 'Auto-map!' button at the top-right. This will map fields with matching names together. You'll see a bunch of yellow mapping lines appear going from left to right. The default guess of Auto-map is right for more fields, but not for Sandbox_Migration_Id__c (see 'Digression: Foreign keys, Ids and External Ids', above). We want to map Id from the left to Sandbox_Migration_Id__c on the right. Unfortunately, clicking on the yellow lines doesn't give you a way of deleting them. 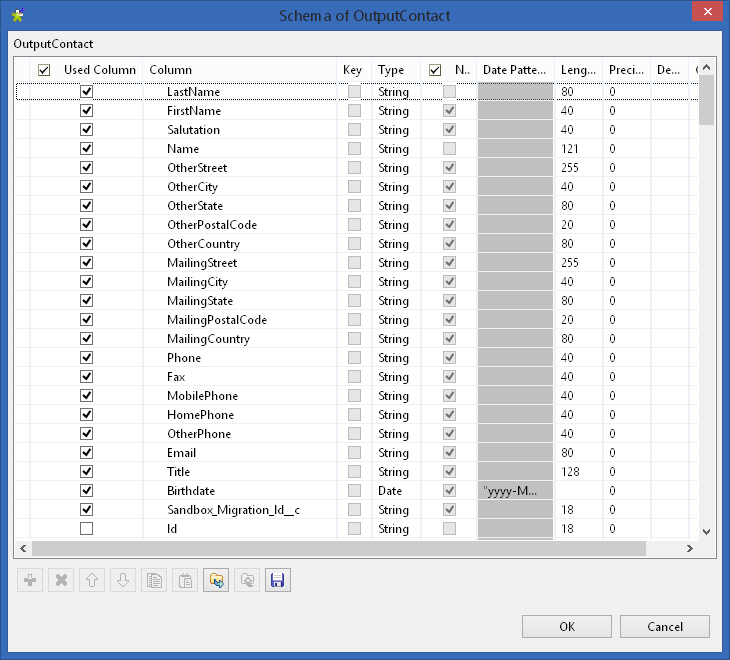 To remove a mapping we must edit the 'Expression' column in the output grid on the right hand side. 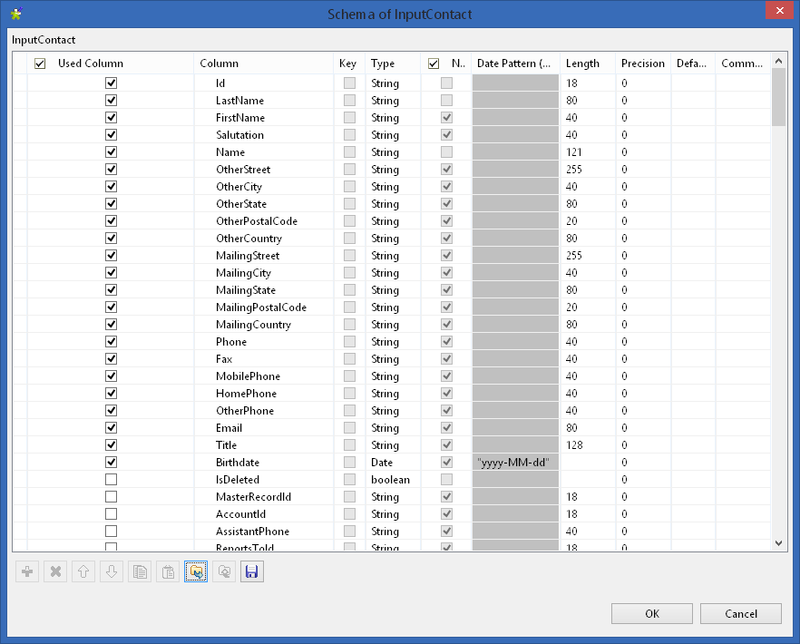 Click on the cell that is in the 'Expression' column for the 'Sandbox_Migration_Id__c' field in the MapAnimalOut grid. 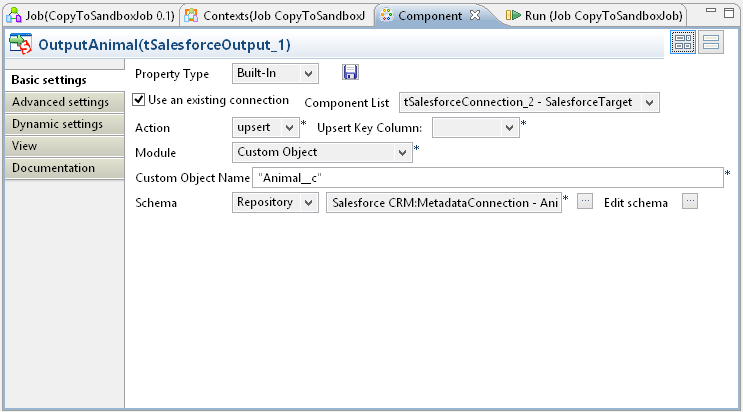 The cell will become editable - remove the text that is there (row1.Sandbox_Migration_Id__c) so that the cell is blank. The yellow line leading to that field will then disappear. Now drag the 'Id' field from the input grid on the left to that same cell on the right (that is now blank). You should then get a yellow arrow from 'Id' on the left to 'Sandbox_Migration_Id__c' on the right. The other way to acheive this is to type 'row1.Id' into the blank cell. In which case press OK to close the mapping dialog. Everything else on that component should be OK because we did it earlier. This is probably a good time to save the project - press the Save icon in the TalenD menu, if you haven't been doing that out of habit anyway. We're now ready to run the thing, and what that should achieve is copying all Animal__c data from Source to Target, mapping the Source Ids into the Target 'Sandbox_Migration_Id__c' field along the way. To run the project, switch to the 'Run Job' tab at the bottom of the screen and press the big Run button. Before if runs, TalenD will show a 'Building Job' progress bar. What its actually doing here is taking the job and compiling it into a stand-alone Java program that you could potentially run separately. 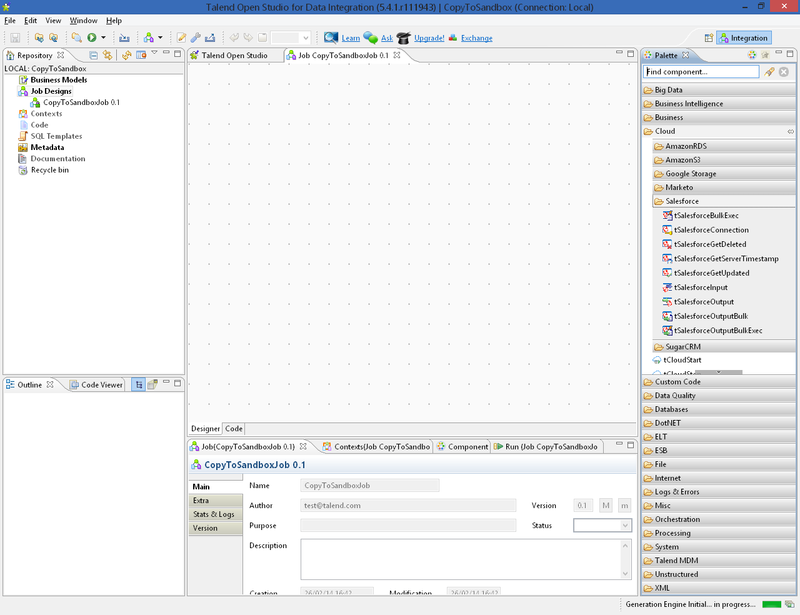 TalenD is based partially upon the Eclipse Java IDE, and so it is able to build programs. We're not really interested in that ability right now, we just want to run it. But its quite impressive. Are your Salesforce credentials in SalesforceSource and SalesforceTarget correct? After much step-by-step work we now have one table being transferred. Now we want to add the other two for our example - Contact and Pet__c. This will largely mean repeating the steps above, but with some differences. As with Animal, we'll have to come back and set Upset Key Column later. To keep this example simple, we're not including any Lookup/Parent-Child fields. Specifically, we're not trying to fill in the Account for the Contact. 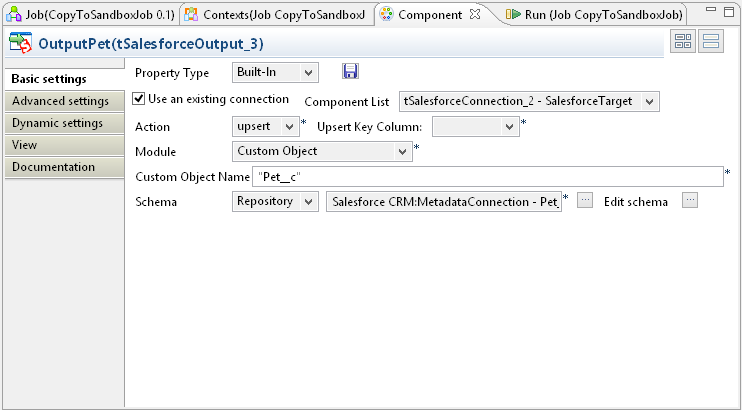 We are including the Sandbox_Migration_Id__c field in the Contact Output schema - this is important for the upserts and Pet__c to Contact relationship to work. That is - auto-map everything, except for Id in the Input which should map to Sandbox_Migration_Id__c in the output. 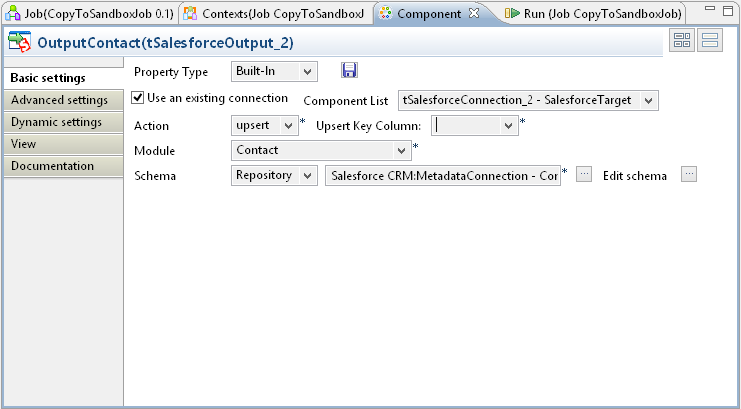 The final thing to get Contact working is to go back to the OutputContact component and set the'Upsert Key Column' to 'Sandbox_Migration_Id__c'. Note that we now have two Subjobs in our TalenD job. TalenD will run them in whatever order it likes (usually, the one added first runs first). Thats OK so far, because Animal__c and Contact are not directly related. 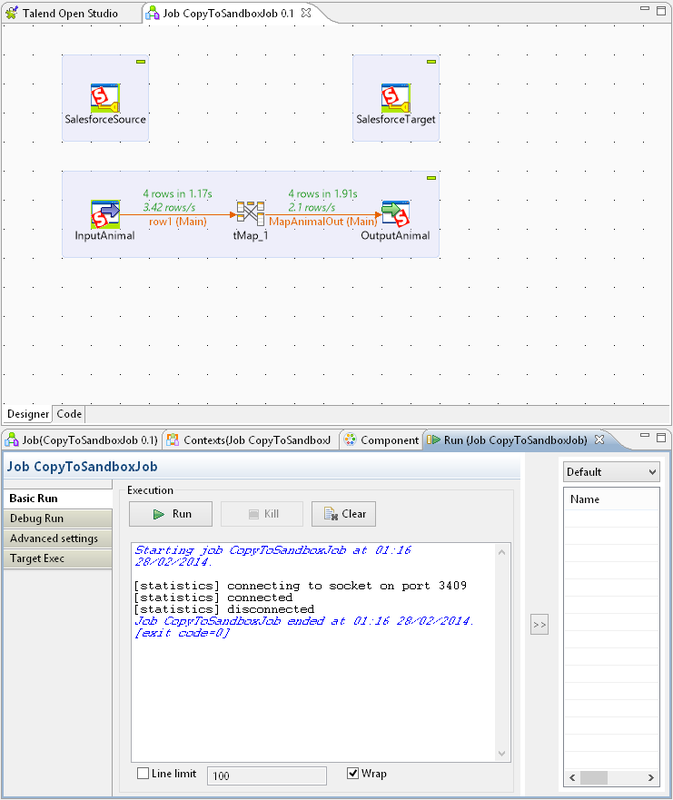 However in the next stage we're adding a third Subjob and we will need to tell TalenD how the Subjobs depend on each other. Now we want to add the Pet__c object. Pet__c has lookup fields to both Contact and Animal__c, and so there will be a few extra settings this time. The one difference is that we want to filter Pet__c, using the same Contact filter. So the Query Condition "Contact__r.LastName='Testperson'" (with speechmarks) achieves this by filtering on the parent Contact's fields. The 'Relationship mapping for upsert' grid is pretty confusing to fill in, the first column is a picklist but the other three columns are just text fields where you have to type the field names (hence the speechmarks in those columns). The Pet__c data has a Contact__c column. Follow the "Contact__r" relationship from Pet__c to Contact and then match the value to the "Contact.Sandbox_Migration_Id__c" column. The Pet__c data has an Animal__c column. 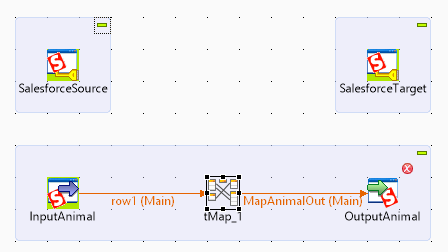 Follow the "Animal__r" relationship from Pet__c to Animal__c and then matchthe value to the "Animal__c.Sandbox_Migration_Id__c" column. 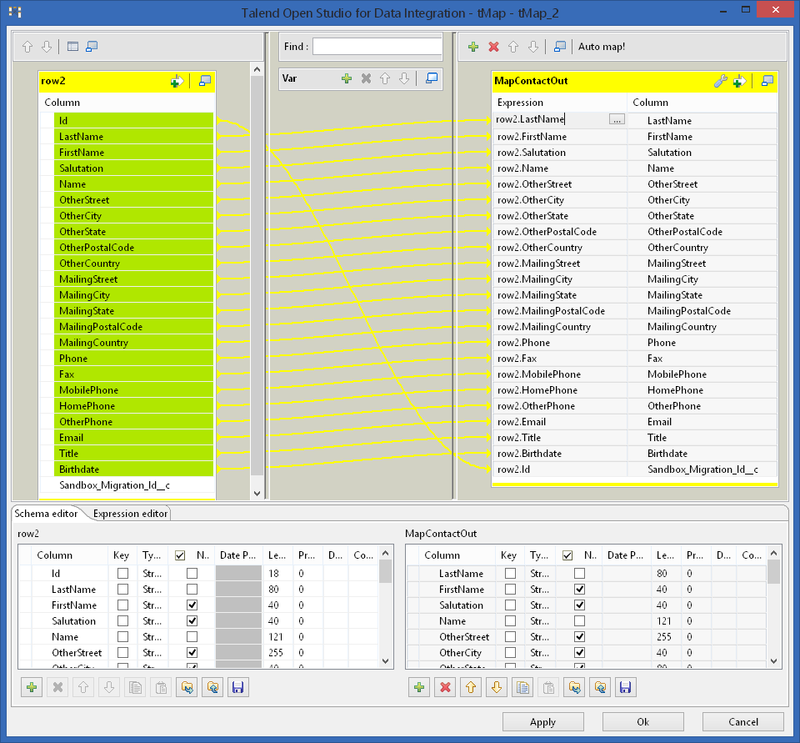 Relationships names from custom objects to other objects generally end in '__r'. However relationships between standard objects do not have the '__r' suffix. Right click on the InputAnimal component and select 'Trigger -> On Subjob OK' from the menu. You will now have a line going to your mouse pointer. Click on the InputContact component. 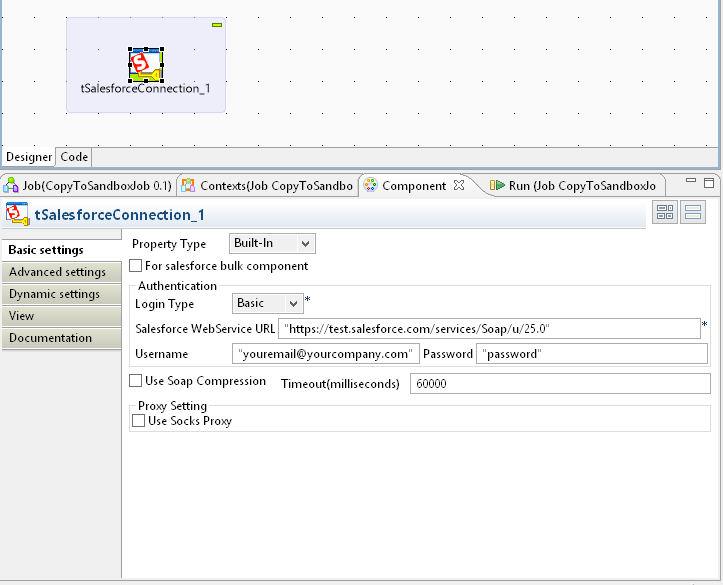 TalenD now knows to only run the Contact SubJob if the Animal Subjob has finished with no errors. Right click on the InputContact component and select 'Trigger -> On Subjob OK' from the menu. Click on the InputPet component to link the line to it. 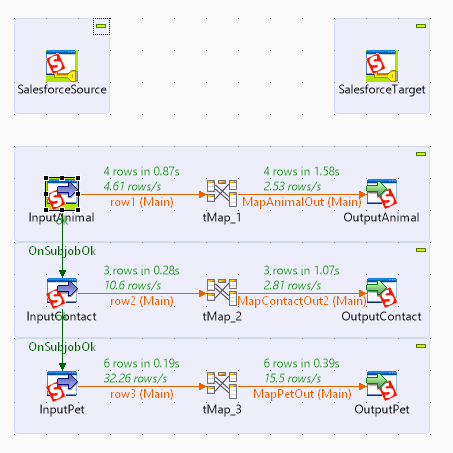 TalenD now knows to only run the Pet Subjob if the Contact Subjob has finished with no errors. 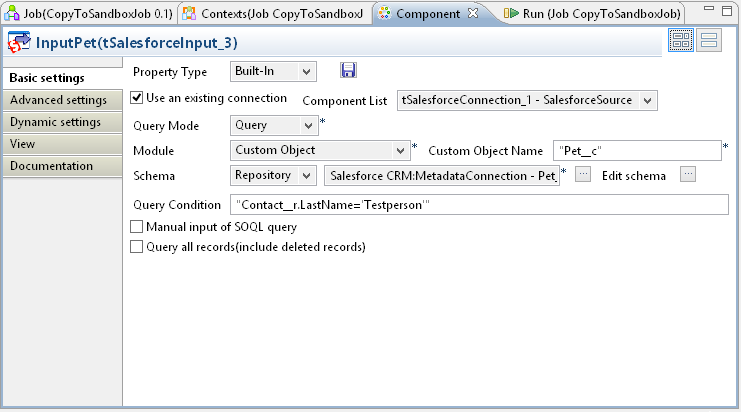 Copying a sample of Live data into Developer sandboxes so that you have something to work with is a common problem in Salesforce. There are various tools for helping with this, including several free ETL tools. TalenD is a whopping big Java ETL that can do the job. When you transfer data, some values get freshly generated, including object Ids. This means care has to be taken with relationships between objects to make those relationships transfer properly. The approach taken above with 'Sandbox_Migration_Id__c' fields is one way of tackling this. Building an ETL package like this to populate a Sandbox takes a bit of effort, but once you have done it you can re-use it again and again whenever you refresh a sandbox. Just changing the credentials in the 'SalesforceTarget' component is all you need to do to point the package at a different sandbox.